gringa.org: Bad Pattern. No Donuts for You! Bad Pattern. No Donuts for You! I got Last Minute Knitted Gifts before Christmas, but didn't get around to trying any of the patterns until this weekend. I'm at another one of those periods in my life where babies are popping up like crazy among my friends, so I thought I'd try the Child's Placket-Neck Pullover. The pattern call's for Koigu's Kersti, but I opted to go with Debbie Bliss Merino DK instead. I cast on Thursday evening, and made good progress over the next day or so. Until I reached the sleeves. There is bad-ness in this pattern, friends. Lots of it. I spare you the details, but if you are struggling with this pattern I will tell you this: (1) if it seems weird to you that all of the raglan decreases are after the markers, you're right (should be: SKK, marker, K1, K2tog), and (2) you're not losing your mind, the pattern really doesn't ever tell you what to do with those 32 (total) underarm stitches that are still on stitch holders (solution: graft them using kitchener stitch). I assumed that since the book was published in October 2004 that there would be no errata information out there yet. Oh, how I underestimate the Internet! I could have saved myself a hours of frustration with a simple Google search. So despite the fact that the pattern in the book is infested with bad-ness, I give credit to the author for posting corrections in a timely manner. I finished the sweater late Saturday night, and blocked it on Sunday. All that's left is sewing on buttons. It's really a very sweet sweater, so I suppose all's well that ends well. 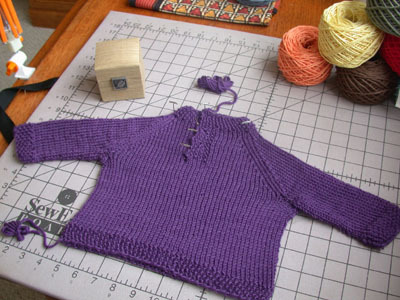 Another cute as you-know-what baby knit! Awwww, it's very pretty! Great job conquering the pattern. Way to hang in there! Lisa, unfortunately I didn't find the corrections I linked to until after I finished. D'oh! But yeah, 6-8 hours? I don't think so. hi there. last minute knitted gifts has a lot of errors. a beautiful book to look at but from what i've read, proofreading of patterns wasn't up to snuff. that sweater is very cute though.